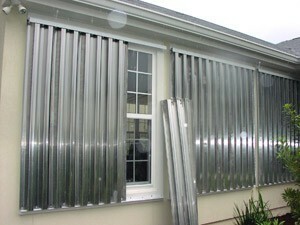 Hurricane Shutters can be installed as a DIY project. If you’re the type that enjoys working with hands then this is a tailor-made project for you and you have a very good reason to do it. You are going to protect your life and property. The plus is that you will get a kick out of doing work yourself and save money. The only important consideration has to be that you do a good job, because this is protecting about all that you hold dear against winds that can rush at 150mph and above and also water gushing as an unstoppable torrent. The simplest and easiest do-it-yourself for putting up hurricane shutters installation is to take a piece of ply and nail it to the openings. It’s the cheapest option. But this is a very temporary solution, almost a last-minute thing to do when you’ve neglected putting up hurricane shutters and then a storm warning happens. You can easily placed plywood protection. Just ensure that the wood overlaps the opening by four inches on all sides and then place lag bolts every one foot. You can paint the shutters so that these can withstand the moisture during a storm and when you store these planks away. A slightly detailed project would be putting up metal shutters. There are a number of DIY sites online that have detailed layouts and plans giving instructions on how to go about getting this job done yourself. Also, keep in mind that you will not be able to carry out this project on your own. You may need help from a mate. And then there is the question of tools, for example you may need nuts, bolts, drill, wood bits, hammer, caulking, screwdriver, paint, paintbrush, etc. if you think this is something you can do, then accordion shutters can be put up as a moderately challenging project. Get the kit, follow instructions, ensure that the shutters and tracks are both laid properly. Step back. And admire your work.